If you're looking for something on a professional level, this is a fantastic option. It offers the ability to diagnose your vehicle issues so that you can potentially fix them yourself, or at least have more control over what mechanics work on. It offers a handy tablet-style design that is very easy to use. This scanner has more of a tablet shape than some of the other units from Autel. You are still able to hold it in one hand, but you are going to want to hold it with two. It is a little on the heavier side, weighing in at 3.5 pounds, but still light enough to hold with one hand. There is a 9.7-inch touchscreen which is much larger than most of its rivals. The use of a touchscreen will also be a benefit to those who are more technologically savvy and those who have had experience with a touch screen before. This device comes with multiple connectors to connect the scanner to almost any vehicle but it also takes advantage of Wi-Fi and cloud technology. You can connect to the engine system wirelessly, as long as the vehicle has that capability. The case is made from durable rubber and has rounded corners. If the device were to fall from a height or even take some impact, the rubber would protect the screen and the internal workings of the scanner. There is an 8-megapixel camera included on this device. Not only can you take high-quality photos with it, but you can also record video. The camera is fitted with a flashlight and auto-focus function. You can use these to record issues with your vehicle system and also use the front-facing camera to communicate with other mechanics or professionals. The scanner is set up to be used with most vehicles from Asia, North America, and Europe. 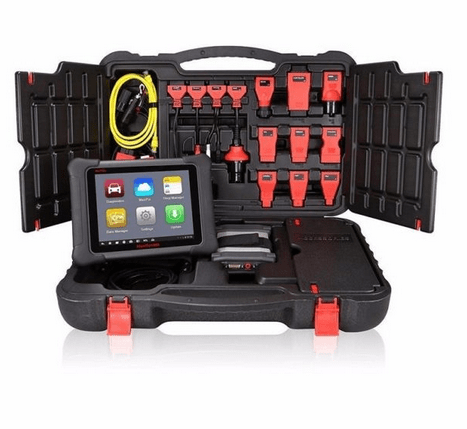 If you work with a lot of cars, then this is the device for you; you are sure to be able to diagnose whatever vehicle comes your way. The company also regularly updates the car list so be sure to check for updates from time to time. The algorithms used in this device are among the most complex and accurate out there. The device will also give you possible causes and solutions to the problem, helping you to fix the vehicle better. 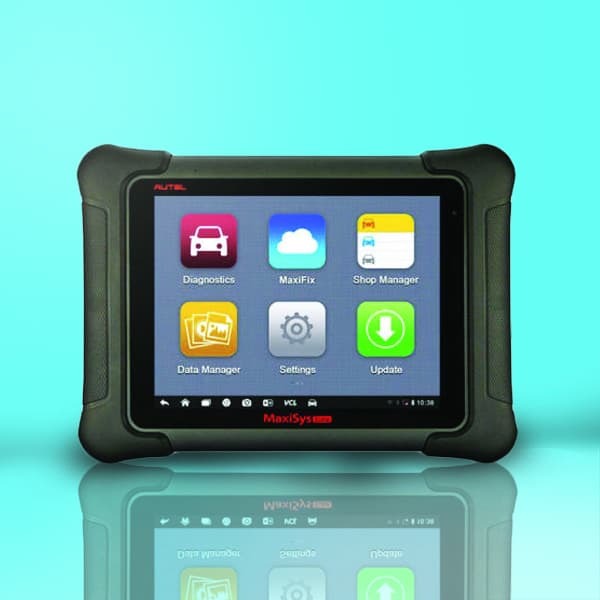 The included Wi-Fi and Bluetooth gives you more mobility when you are diagnosing a vehicle. You do not have to limit yourself by the length of a cord. You can also move about freely without ever losing the connection. The navigation on the screen is intuitive and easy to use. Getting from one screen to another is easy to do without having to pick up the instruction manual. You can also toggle the navigation so that it is off screen and you have more space for the diagnostics. Troubleshooting is easier with this device. When the problem is diagnosed, and the code is displayed, you do not have to consult the manual as a short description of the code is displayed alongside the code. The scanner is a touch-screen device. This makes it easier to use and navigate. You do not have to press buttons to scroll through menus or move over the screen. You can press on the screen to control the device as you want to. The included battery is lithium-ion. It takes 3 hours to charge fully, but when you do have it charged, it will give you 8 hours of battery life. There are not many things wrong with this product, but some people may be put off by the price tag. This is a high-end scanner and developed to diagnose complicated problems. This is the tool which professionals would use in their diagnosis, so it does warrant a higher price point. Being a more professional model, this scanner not suitable for low-end mechanics and fixes. The system is advanced and will diagnose complicated issues; this is not a scanner which you will use of the run-of-the mill issues. This is a performance scanner. It has been designed for simplicity, speed, and control. It is a device aimed at the professional and has a price tag to match. This is not the device to use for your own vehicle; it would be overkill to use this, but if you have a large fleet of cars to service, then this scanner will eventually pay for itself.